I want to rebound quickly and having been so good at avoidance for so many years, this protocol should get me back on track. 1. Get hydrated with water. Drink plenty of it. Drink it warm with lemon in order to loosen congestion. If you like, try sipping broth – vegan or not according to your tastes. 2. Lay off caffeinated beverages, soda and alcohol. Each of these only counteracts the good hydration so stay away until you’re mended. 3. Gargle with warm salt water. I had to do this as a child and really didn’t like it. I still don’t but google any cold remedy and it’ll pop to the top of wise advice. We have an electric teapot that is terrific for this. Simply add 1/2 tsp of sea salt to the warm water. Be careful not to burn yourself but do gargle the entire glass. 4. Also try saline water for the nose. Personally, I use a neti pot of salt water to eliminate stuffiness. This removes mucous and reduces swelling in your nasal membranes. If you don’t have one or haven’t mastered this technique, look for saline nasal spray. 5. Read up on Zinc. It’s been touted as a cold remedy for so long but if I haven’t eaten, it’s a quick way to an upset stomach. There are numerous studies that show it’s not as helpful as we’ve heard for so many years. 6. Consider putting three drops of hydrogen peroxide in each ear. This is touted by some as a way to diminish symptons. 7. Eat clean. My own protocol is to stay away from dairy most of the time but especially if a cold has struck. This cuts down on the mucous forming agents and is why chicken soup is recommended by so many. 8. Rest. Take a nap in the middle of the day. Turn in early and stay there for a bit longer than you otherwise would in the morning. 9. Don’t be sucked in to the numerous over the counter medications at the pharmacy. It will pass and with luck and the right protocol, more rapidly than you may have expected. 10.Eat plenty of vitamin C rich foods. 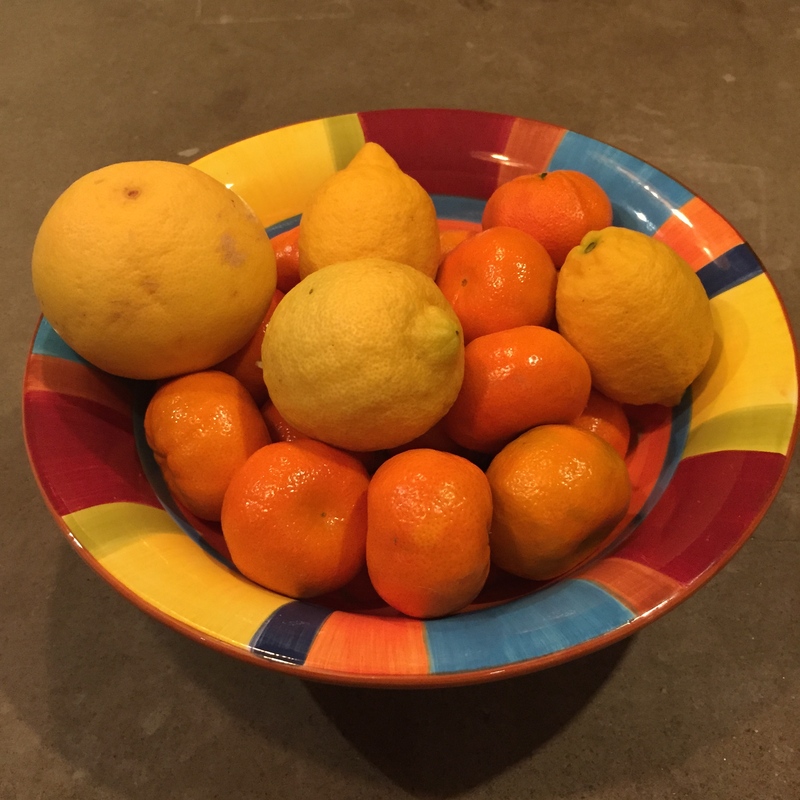 It’s citrus season here so I can blow past my daily requirements with ease. Spin it all in a high-speed blender for a few seconds until smooth. Of course, you can add other fruits such as organic strawberries or turmeric. Drink it down and hit the sack. It is not just a good to do – there is actually evidence that it helps! Sorry you are under the weather – major bummer!! Everything you said, with the salt water gargle, zinc and fresh citrus, and YES to the chicken soup. It is the lysine and Oregano cooked in the broth. I use oregano oil tinctures and RESCUE remedy and aconite as well. Studies also show, COLD-EASE helps to diminish the cold effects faster. Bummer, Tammy. I am so sorry. Hi Tammy, on my website, I have a home remedy that has been my most shared and commented post ever. It uses everyday pantry ingredients: apple cider vinegar, honey, ginger, and cayenne. It really helps! If I sense the “tickle” of a cold on the horizon, I pop a few Vitamin C pills, stay away from crowds, and make sure I get plenty of sleep. I haven’t tried this, but a few people have recommended a tsp of honey mixed with cinnamon to heal fast. Hope you rebound in short order. When looking after yourself fails…or someone sneezes into your hair on the subway…Well, I try to sleep enough and eat right, but 2 things: Umcka, used when the sore throat is starting, can literally stop a cold in its tracks. Staying home and resting the day I feel it coming on works sometimes as well. And if it’s gotten away from me, I use lemon juice beaten with honey to calm down a cough. Haven’t had to do that this year. Thank goodness. Hope you feel better soon!!! I love, love your posts Tammy! My go-to remedy is honey and tea (herbal) and rest. I agree with all ten of your suggestions. Same happens with me if I allow myself to NOT get the necessary rest and skipping hydration! I got my first cold in a bout 5 years last winter. It really does hit you then.